Beautiful hair can do wonders for a woman’s ego especially when it looks like you walked out of a salon. However, you may want to start tipping yourself once I tell you about the InfraShine UL3 Cool Switch Ceramic Blow Dryer for all the money and compliments that you’ll be piling up! This is a quality professional model with amazing FAR-Infrared Ceramic Heating Technology to lock in your hair’s moisture through the power of negative ions to give it incredible softness, shine, and smoothness. You’ll love how lightweight this blow dryer is besides the curved handle for a comfortable grip. The long tangle resistant cord is fantastic also since it gives you more room to maneuver for heavy-duty daily use. Another nice feature is how you change the nozzle with the accompanying diffuser with just a snap. Since I have some curls and layers, I really liked using my new diffuser attachment for making most of what I got as far as curls are concerned. Besides saving from fewer salon visits, you’ll pocket even more in energy savings. This has 2200 watts, but uses only 1400 watts, which adds up over time and how much faster your hair dries. I don’t know about you, but I love my new blow dryer with a passion. Why use just any blow dryer when the InfraShine UL3 Cool Switch Ceramic Blow Dryer can make a beautiful difference in your life? Do check it out because I assure you that this would make the perfect Mother’s Day gift! 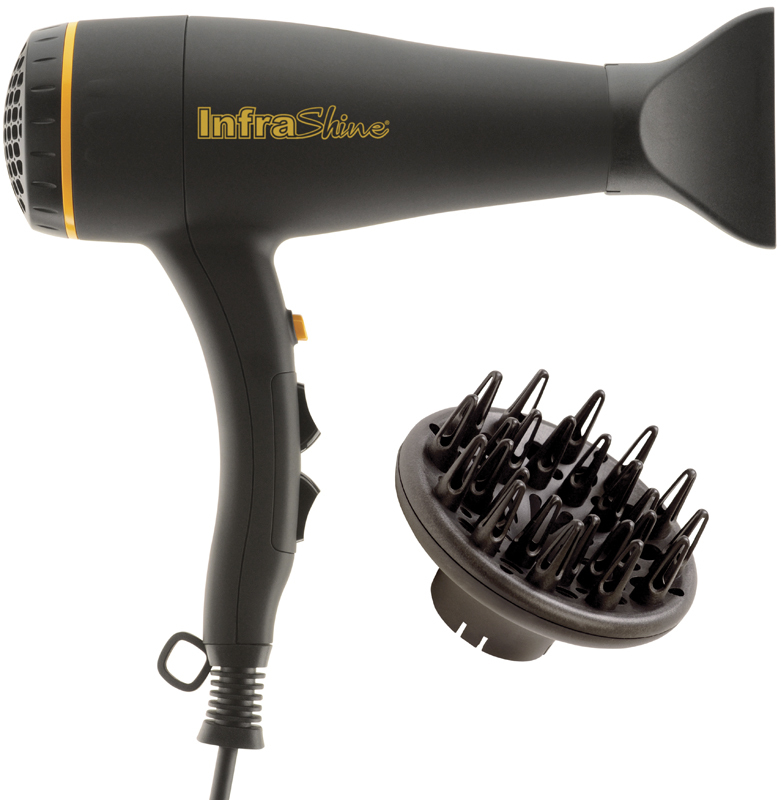 Thanks to InfraShine, one lucky Nuts 4 Stuff reader in the continental United States wins the InfraShine UL3 Cool Switch Ceramic Blow Dryer ($240 value)! 2. Go to InfraShine and tell me what other product you would love to try first or something else you learned from their website in another comment. “Like” InfraShine on Facebook–2 extra entries to leave in 2 separate comments. This giveaway ends May 2, 2012 at 12 PM Eastern Standard Time. The winner will need to respond to my email with name and shipping address within 48-hours or another winner will be picked. gfc eclairre(at)ymail(dot)comI would love to try the redline flat iron! I'm a GFC followervenus m.
I'd also love to try The InfraShine AeroPlus styling iron! I would like to try the Redline Flat Iron. I learned that hair is made up of 97% keratin protein and 3% moisture lipids but the moisture accounts for 98% of the weight. I follow you on GFC as rusthawk (rusthawk at gmail dot com). I would like to try the The Large Flat Iron – The lightweight 2-inch paddles speed up styling time on long or thick hair and provides a quick boost to chemical treatments. gfc follower jtwark and learned InfraShine flat irons can be used to accelerate professional chemical processes? I like Infrashine on FB as Susan Chester. 2.I like Infrashine on FB as Susan Chester. The Aeroplus sounds nice.I am a GFC follower under Tamar W.tamarsweeps at gmail-dot.comThank you. I liked Infrashine on facebook! i follow on google connect; Melissa Angles, and my email is missycangles(at)yahoo(dot)comI'd also loooove to try the spring iron!!!! I would like to try the 1.25” spring iron. I'm a GFC follower (Gianna).cmanventuresinc(at)gmail(dot)com1.25” Spring Iron. I'd like to try the 1.25" spring iron. I learned that InfraShine’s PTFC infrared heating technology produces 2200 watts of drying power using only 1600 watts of electricity. I tweeted the requested message on Twitter at https://twitter.com/#!/likwan/status/197695732264869888. I entered the Balance Bar Mother's Day Nimble Gift Bundle giveaway.